Swedish striker Zlatan Ibrahimovic has completed his 46 million euros ($65m) transfer to Barcelona from Inter Milan on a five-year contract, with Samuel Eto’o and Alexander Hleb moving to the San Siro as part of the deal. Ibrahimovic completed his medical on Monday and the deal was finalized despite scans showing the striker has a fractured bone in his left hand. “It’s a very big move for me and too good to turn down,” Ibrahimovic told a news conference at the Nou Camp following his signing. “There comes a time when you want to develop more and my desire to come to Barcelona was too big to stay at Inter.” And Ibrahimovic revealed that Inter president Massimo Moratti had given him permission to leave several months ago should an offer from Barca arrive. “Moratti helped me in every way, he did everything for me and my family. I said to Moratti a few months ago: ‘Nobody can get me, only one club can get me and that’s Barcelona’, and he told me: ‘if you want it like that you will get it like that’. So all my respect, because it is not easy to sell a player that means so much to the team,” he added. The 27-year-old hopes to emulate Eto’o, who was a prolific scorer during his time with the European champions. “I’m not coming here to be Samuel Eto’o, I’m somebody else, somebody new, but I will try to achieve as much as Eto’o, or even more,” he added. Barca president Joan Laporta hailed the Swede’s arrival. “He is not a conformist, he is ambitious, a winner, an authentic man with strong feelings and he wanted to come to Barcelona,” he said. 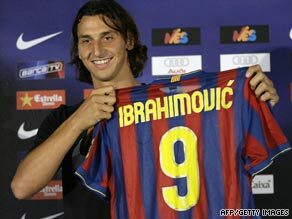 “Coach Pep Guardiola said that Zlatan was the ideal player for us, so we are really happy to have him here.” Wearing the number nine shirt formerly held by Eto’o, Ibrahimovic later received a rapturous welcome before tens of thousands of fans at the Nou Camp. Meanwhile, a statement on Inter’s official Web site welcomed Eto’o’s arrival at the club and revealed the 28-year-old will be presented before the media on Tuesday. “Everyone at FC Internazionale and all the fans warmly welcome Samuel Eto’o to the club, and are proud to have him in the team, convinced that new and important triumphs will be reached together.” After completing his medical on Monday, Eto’o said he was looking forward to establishing himself as a force in Serie A after five prolific seasons with Barca. “I made history at Barcelona, but that history is finished now,” he told reporters. “A new story begins at Inter; I’m starting from scratch; I want a new adventure and I hope everything goes well. “I can’t but wish Ibrahimovic good luck. I have won a lot at Barcelona and now I hope to do the same with these colors, if not, more. “I promise the fans that I will work every day, as I have always done,” added Eto’o — who scored 39 goals in 49 appearances for the European champions last term. “This is at the base of everything. I believe in my work and the group. I don’t have to say that what I want to do is score even more goals; I know I’m capable of scoring goals and I know that through my work I will score even more.” Meanwhile, former Arsenal midfielder Hleb will join Inter on a season-long loan deal. The Belorussian had shown some reluctance to agree to the deal, but it may end in a permanent move — with Inter having an option to buy the player for 10million ($14m) euros after his loan deal expires next summer.